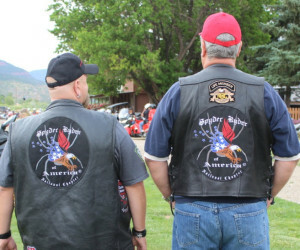 Spyder Ryder of America is pleased to announce the return of the National Membership Program. The old program was frozen at the end of 2014 for new memberships. It has reopened for 2016.
or for $130 you get the LARGE National Chapter Jacket Patch (12″ by 13.5″ oval) the 4″ X 4″ National Chapter patch and a “2016” year bar as well. National renewals are $40 each year and you will receive a new year bar with each years renewal. Here is a picture of the large National Chapter patches. Click the link above to download the application.